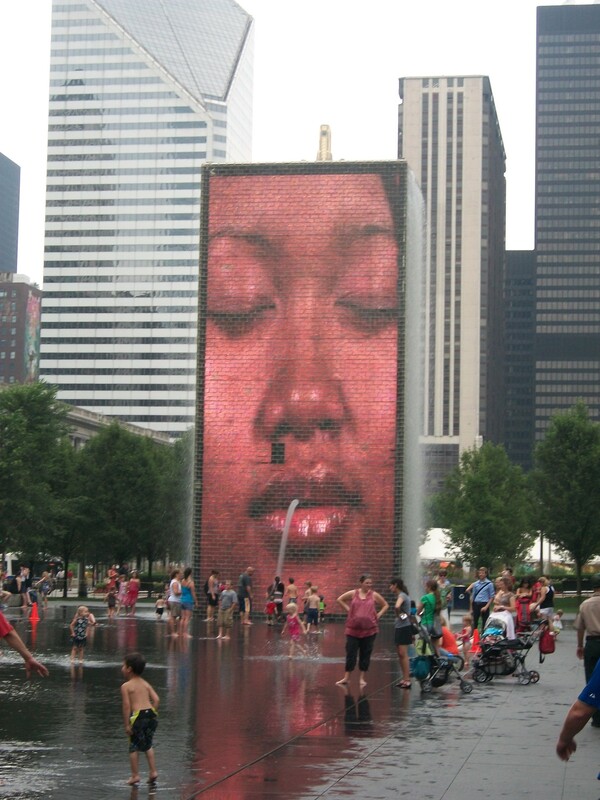 Chicago is like New York but with lots of fountains. There are massive skyscrapers, a body of water in almost every direction, good public transportation, lots of people moving quickly and purposefully in all directions, gorgeous architecture, huge public parks, two very different baseball teams, massive amounts of traffic, and no place to park. I love this place. Despite leaving our suburban hotel after rush hour, we hit our first traffic of the trip. It was oddly refreshing. As much as I enjoyed being practically the only car on the road when we drove through Buffalo and through Cleveland during what should have been the height of morning and evening rush hour, respectively, no city should be that easy to navigate. Chicago’s traffic reminded me that it’s no pushover. Once in the city, we started at Millenium Park, which did not disappoint. The first thing we bumped into was the relatively new Crown Fountain, comprising two rectangular brick towers about 30 yards apart. 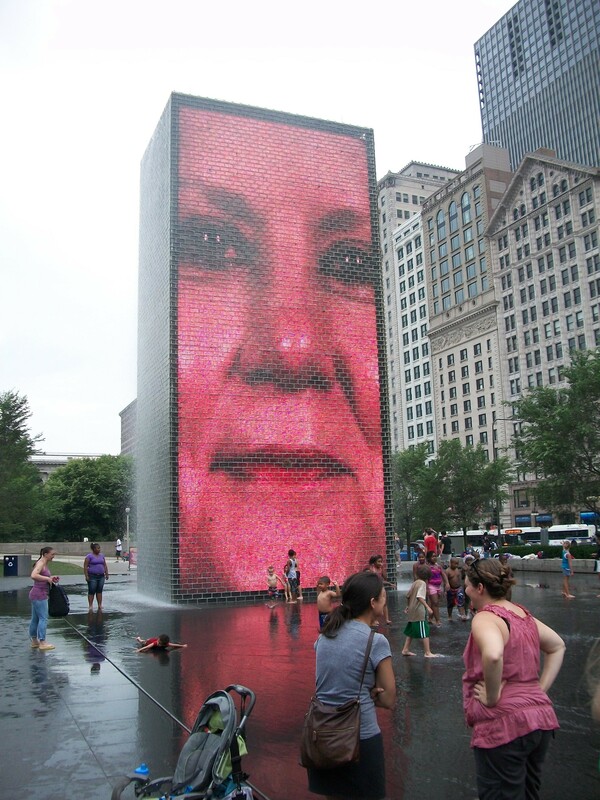 Each tower spews water from all sides and features, on the side facing the opposite tower, a giant LED display of a person’s face. The faces change every few minutes, and occasionally appear to spit a huge stream of water from their mouths. 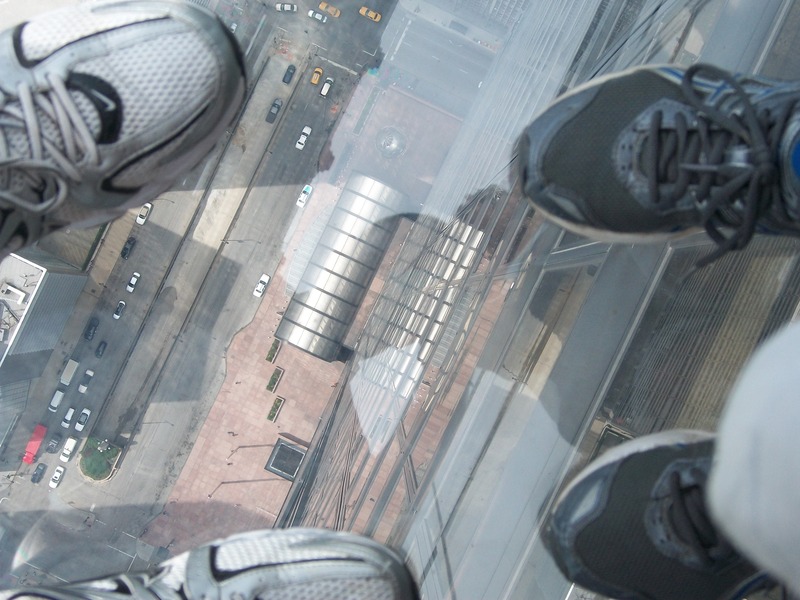 Dozens of small children run between the towers screaming while their parents sit on the concrete ledges that surrounds the structure and take pictures. It was at about this time that we really started to notice the heat. The high today was well into the 90s and the humidity was up around there, too. This is my third time in Chicago and all three times have been on summer days so oppressively hot and humid that you have to wonder how the city ever has winter, let alone the brutal winters it has. With winters and summers that are both worse than New York’s, it’s really a wonder that people here aren’t crankier. 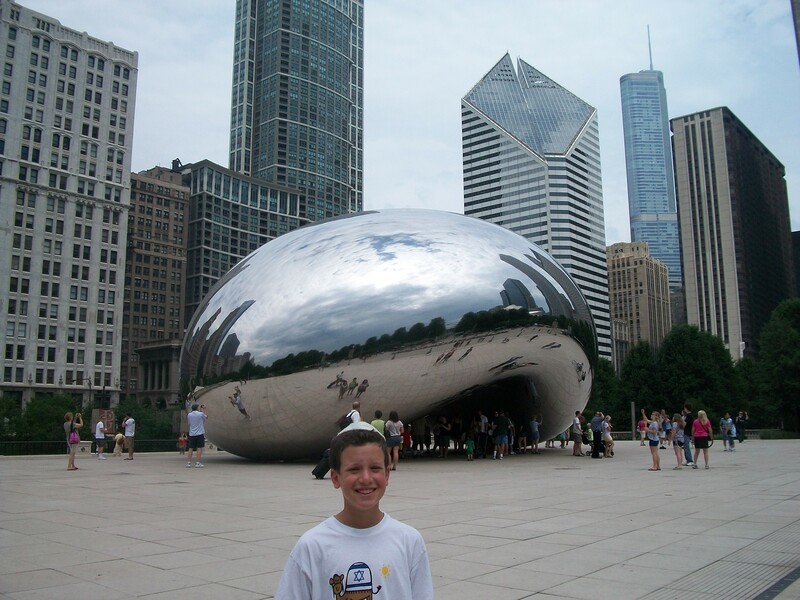 Anyway, we soon moved on to Millenium Park’s other relatively new attraction: a large, highly reflective stainless steel sculpture officially known as Cloud Gate but locally known as The Bean. Our next stop was Navy Pier, an over-touristy South Street Seaport-type area but without the working seaport. We decided to walk there. Big mistake. The walk took us through an especially pretty part of downtown Chicago full of extraordinary old buildings and some cool statues. But the heat and humidity were just too much for us. 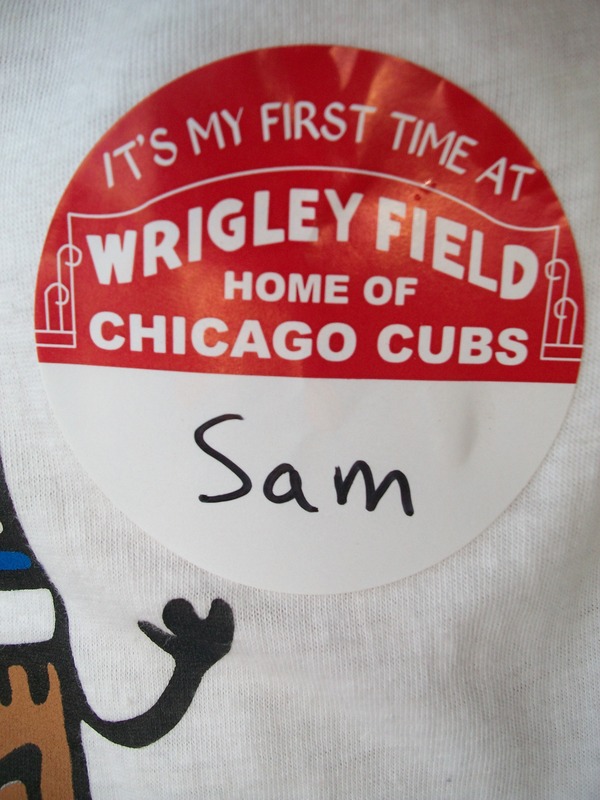 Sam got super cranky, I got super cranky about his crankiness, and the entire day was almost derailed. Stopping briefly in the ATM lobby of a bank for some A/C helped a bit, but by the time we got to Navy Pier we were wiped. 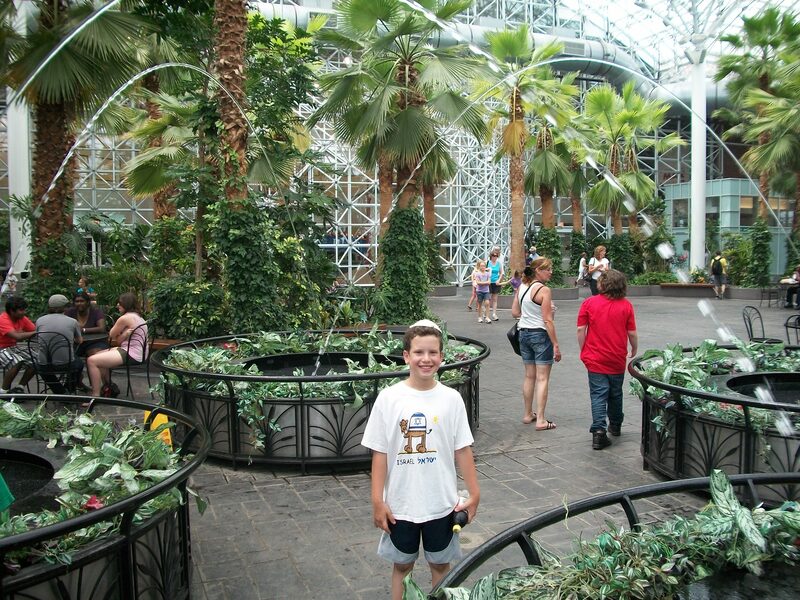 Ahhh, Navy Pier. A Bubba Gump restaurant, a bunch of souvenir shops, an overpriced mini amusement park that includes one of the tallest ferris wheels in the country, lots of cute statues, and thankfully and indoor (air-conditioned) seating area with several cute fountains. Thanks to a nice breeze off the water, we summoned up the energy to walk around a bit, rode the ferris wheel, which provided fantastic views of the city, and sat inside watching the fountains for a good, long time. The original plan was to try to figure out Chicago’s famous “L” train and take it to the tower formerly known as Sears. We were somewhat refreshed but still exhausted, and Sam was begging for a taxi. I found a solution that gave us both rest and adventure: a water taxi that took us from Navy Pier down the Chicago River and docked a block away from Willis Tower. I’d been hearing that the John Hancock Center, about a mile north of Willis Tower and almost as tall, has views just as spectacular for less money. 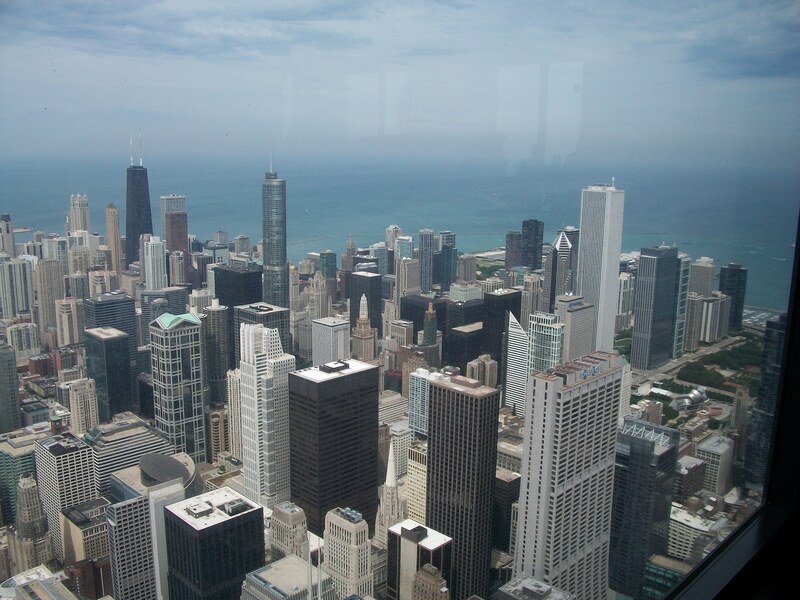 But when you’re going coast-to-coast to see as much of the country as you can squeeze into five weeks, you don’t settle for the third-tallest building in Chicago when you can go to the top of the tallest building in the continent. We had a great time at Willis Tower, which had MUCH shorter lines than the Empire State Building, incredible views despite what had been a cloudy day, air conditioning, and four glassed ledges in which you are physically four feet outside the building suspended 103 stories above street level by nothing but glass. Back on the ground, we took a walk to the famous Buckingham Fountain in Grant Park (“Chicago’s Front Yard”) before paying a kazillion dollars to get our car out of the underground parking lot and head back to our hotel for the most exciting part of the day: Mommy! 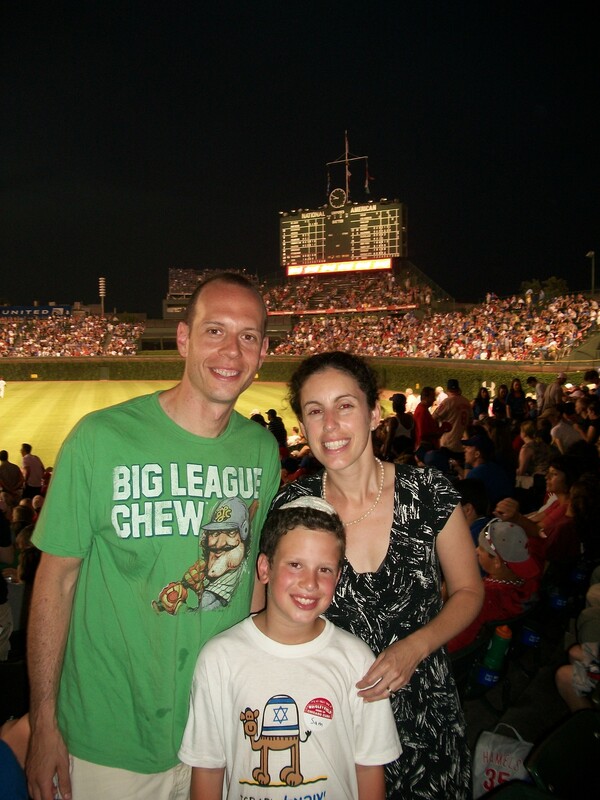 Sarah was in town for business and met up with us to have dinner (Ken’s Diner, the best, quickest, and cheapest kosher food in Chicagoland) and catch a Cubs game. Sam was thrilled to see his mom, though he soon got irritated that she and I were paying some attention to each other instead of devoting all our attention to him. 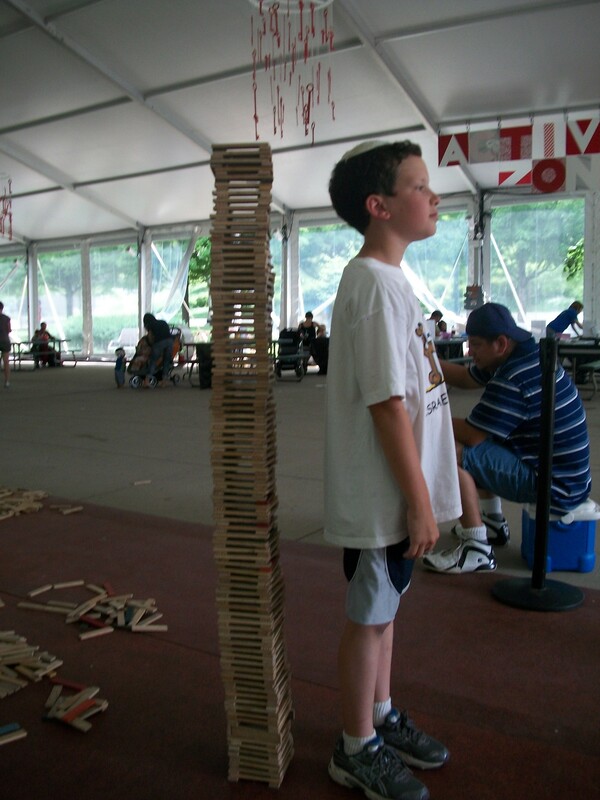 He got over it, though, and started to enjoy the game. The weather was still pretty brutal. But our seats were fantastic (and better yet, free! 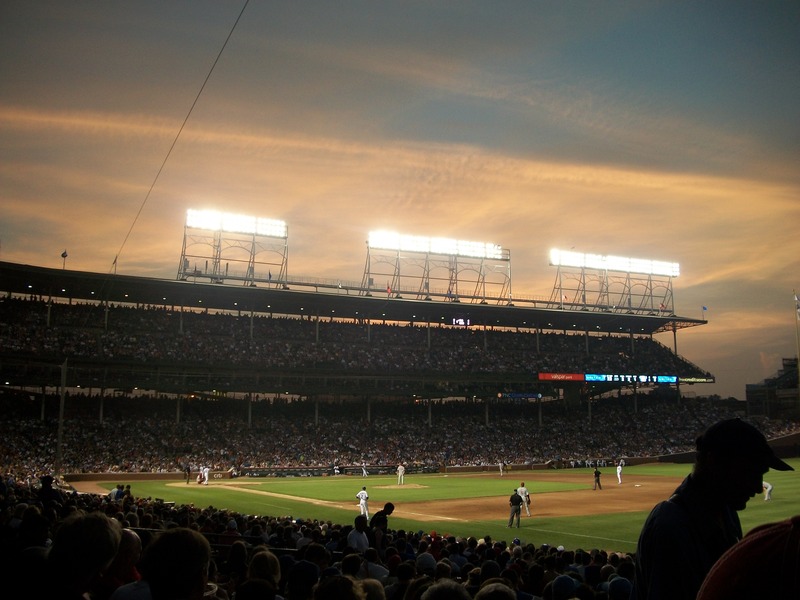 ), Jim Belushi led us in singing the national anthem, the Cubs won, and for one night were were all together again. It was a great day. A very hot, very humid, very great day. 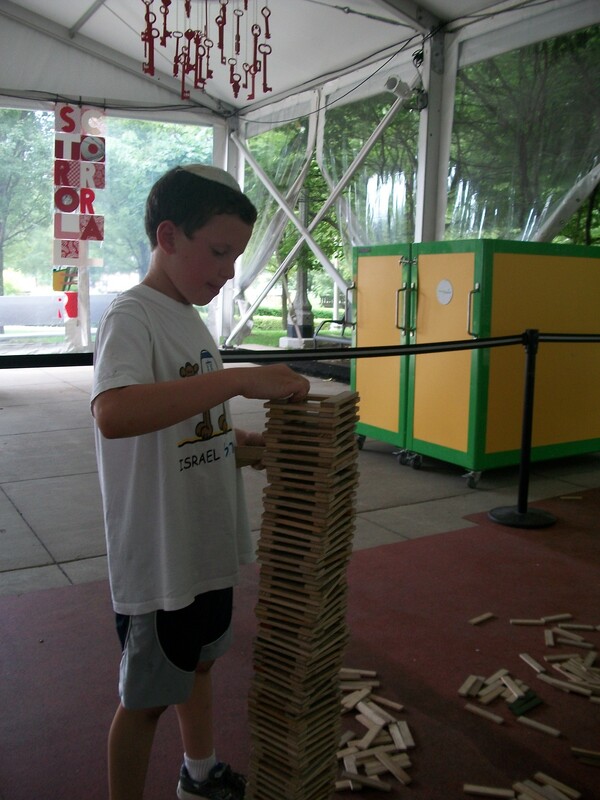 With tower building skills like that Sam should try put for Survivor, though with no ability to deal with the heat maybe not.